When you visit another culture you realize how differently other people see the world. We tend to feel that our “modern” world-view is the most correct because we are the smartest people who have ever lived on the earth. And yet, the fact that we are willingly destroying the life support system of the earth creates questions about how smart we really are. The way in which our life-style is destroying the life support system within our bodies also calls into question even our dedication to survive. Tai-chi practice is a way of introducing into the modern world, the concept that each of us is an ecological environment, completely connected to the larger ecological environment. How we balance the internal ecology with the external ecology should be a large part of our “personal culture”. If we can experience our bodies as living and conscious, rather than just a machine that carries our head around, we can begin to restore our health. Our modern culture is based on the isolated individual, each of us fighting against all the others. To maintain this feeling of isolation we “condense”, that is, we tighten ourselves physically and mentally, turning ourselves into a walled city. We feel that, as long as our lawns are green, the rest of the environment doesn’t affect us. According to Tai-chi principles, the destruction of the natural world and the destruction of our own physical health, arise out of the same mind-set. When we practice the two-person exercise of push hands, for example, there is a tendency to use physical strength to push the “opponent” over. It is common for someone, being pushed, to grab the arms of the pusher to avoid getting pushed and thereby be able to say that he didn’t really get pushed. Push Hands is a game of transformation. It is based on not using tension but fluidity. It is based on allowing the push of your partner to be absorbed by your body, the force distributed among all the muscles and joints, and then transformed to go back to the pusher. Your role is to transform the force that comes to you. In this way you learn the connection between your inner self and its connection to the forces around you. 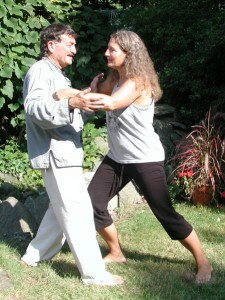 When you learn Tai-chi forms, it is not just a question of memorizing movements. You learn to generate movement from the relationship of the hips and legs to the root (your connection to the ground). The rest of the body then expresses that relationship. So forms teach you how to express your relationship to the earth. There is a tradition, in Zen practice, of expressing your feelings at the moment of enlightenment. One student expressed it this way, “The inside and the outside – they are made of the same flesh”. Every time you tense up and isolate yourself, you damage not only yourself, but also your connection to the earth, and even the earth itself. Every time you set yourself against others in anger, you do equal damage. Tai-chi practice teaches you how to live an ecological life in the modern world. Practicing Tai-chi this way is a powerful way to transform your life.